This one picture nicely illustrates how I envision “Inhabiting Eden”. Shown is an old hospital bed. As a child from a medical family I grew up around beds like this; I remember them well. And this brings forth my first spiritual metaphor. In the Bible, God planted the garden of Eden and entrusted it to human hands, charging us, humans, to keep it and guard it. In the Bible, there are no transcendental, otherworldly, extraterrestrial Edens, and there are no other alternative words. This world is the only one we have, and right now it is not feeling particularly well. Because of generations of human ignorance, negligence, indifference, disobedience, selfishness and abuse, our world, our Eden, is in sad shape, it needs our attention, gentle nursing, and time to heal. Our very own well being depends on it, it is our Eden! And that brings forward the second spiritual metaphor in this picture. 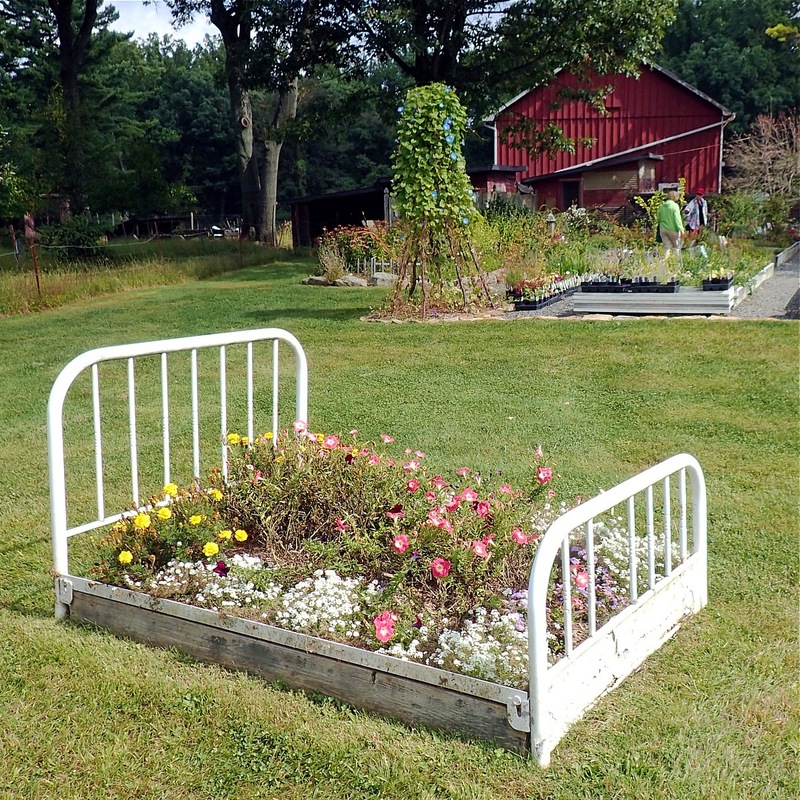 We can hardly find any better place for our own well being and healing, than nature’s garden beds. Just ask any phyto-pharmacologist. In our church you are in luck; one such expert worships with us every Sunday. Right now he is away for the next few months visiting and studying plants of the Far East, but you can still write and ask! I am almost certain he will confirm that the garden beds of Nature are the best and surprising sources of healing medicines. (Am I right Ed?) It is indeed in our own interest to allow our world and nature to heal, so that it can continue healing us. 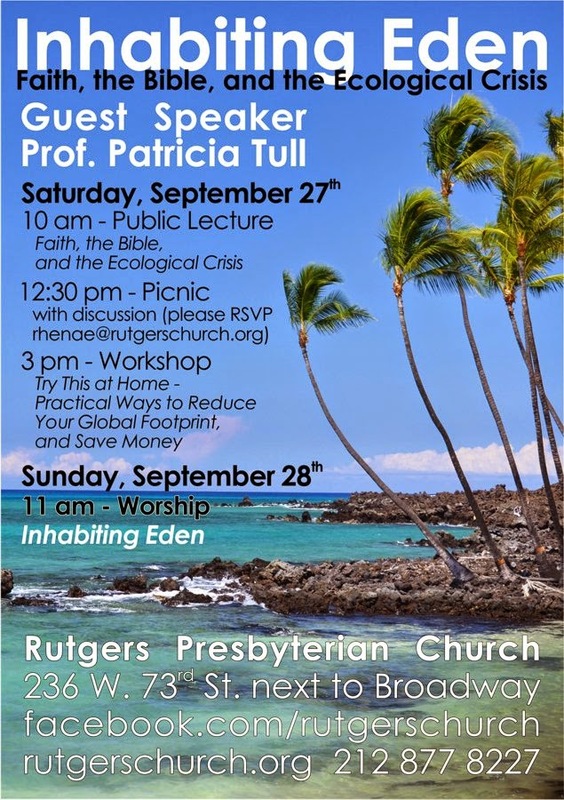 Come this weekend (Saturday and Sunday): our autumn guest speaker and preacher professor Tricia Tull will lead us in seeking how to faithfully and responsibly live in Eden, sharing in healing and mutual care with Nature. I took this picture last weekend when we visited Well-Sweep Herb Farm in NW New Jersey. They grow and sell an unbelievably wide selection of kitchen and medicinal herbs - for instance 95 different varieties of thyme! Now this Jesus, when he was a little boy, like two or three he was, his grandfather Jack kept a vegetable garden just behind their home. And he toddled all the time behind his beloved grandpa. One day Jack went to his garden to pick up snails from his lettuce and strawberries and he just kept crushing them under his feet. And Jesus is behind him and snapping his fingers, and making them whole again right behind his sandals. And Jack is like, “Are you kidding me? I could not believe this!” and “Don’t do it!” But snap, snap, snap, he restored every single one of them together with their shells and tentacles and even slimy paths. “We are not going to have anything from my garden this year, this little rascal loves pests better than my strawberries!” Announced Jack at home. But overnight Joseph had a dream, the angel of the Lord gave him some clear instructions and in the morning he made a nice wooden box with a mash over it. Snap, snap, snap Jesus brought out all the snails from grandpa’s garden into his box and kept them there in a snail-zoo, feeding them with some odd lettuce, cabbage and turnip leaves, and releasing them right before the autumn hibernation. That is how Jesus saved snails and at the same time everyone could enjoy strawberry ice cream and green salads that summer, and next year Mary learned to make delicious escargot to keep the infestation under control, while Jesus grew ever taller and more mature in spirit. This story clearly does not contain any genuine historical gospel text as anyone can see - strawberries were not cultivated in the biblical times and escargot was never kosher! * What we have in front of us is a fragment of an infancy gospel which only attempts to look like authentic Manhattan Gospel of Henry Rutgers** while it is ignorant of contemporary Jewish customs. But this verdict does not mean it is completely devoid of any meaning. Just like other stories about infant Jesus our fragment is not genuine material, but it still highlights some authentic and very important biblical themes: God has a week spot for all the creatures who are being labeled pests; God strives and struggles for all creatures who are being crushed, God has a deep interest in preserving the broadest diversity of life. 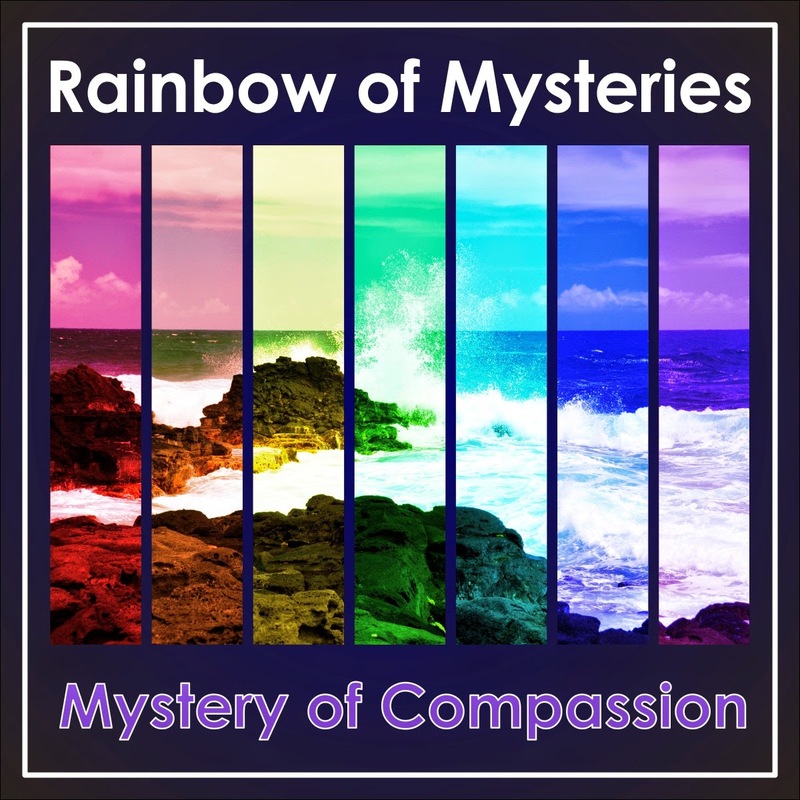 Join us for Sunday Worship to celebrate this Mystery of Divine Compassion. *And beside these facts the language is not in a nice and clear KingJamish (proper NewYorkish biblical dialect) like the rest of the Bible but it is just a mere Old Vernacular Highschoolish (Native Medieval SchoolEnglish). ** Some older reports on fragments of the authentic Manhattan Gospel of Henry Rutgers can be found here, here and here. The rock in this picture is quite unique. I picked it up last weekend, when my wife Martina and I visited an old zinc mine in northern New Jersey. A jovial retired miner led us underground. “All this gray rock around you,” he informed us, “is Franklin Marble which formed at the bottom of the sea about one billion years ago.” He said it with casual nonchalance but it took my breath away. That piece of rock alone is thousands upon thousands times older than so many of our fundamentalist compatriots reckon for the entire universe! If we visualized the age of this rock (one billion years) as one mile (distance From Rutgers church to Madison Avenue), the entire history of human civilization (about eleven thousand years) will fit into a little more than the last half-inch! The age of the rock alone inspires respectful reverence and reminds us of our human dimensions. But as you can see, this rock has also some special properties. 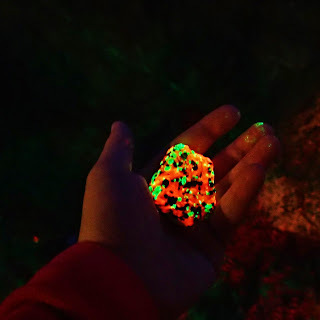 It fluoresces and shines! While this marble rock was formed at the bottom of a sea, volcanoes erupted nearby and deposited a treasure trove of minerals. Over long aeons of time these minerals formed rich seams and veins of ores. Under a UV lamp those mineral come alive. Ordinary gray rock is suddenly intersected and crisscrossed with neon colors. It is not only a bright visualization of rock formation and ore geology, but also a surprising, beautiful and awe inspiring show. Down underground, in the New Jersey mine, we experienced first hand why the book of Job perceives the rocks under our feet as capable and bright teachers of divine wisdom. As we continue celebrating powerful mysteries of nature, come this Sunday to search and celebrate divine Wisdom (reverence, curiosity and beauty) hidden in rocks and ores. 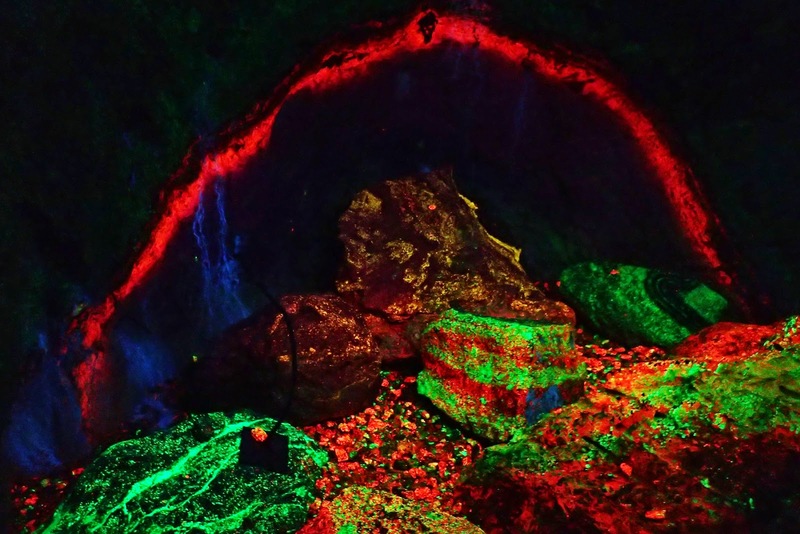 Layers of minerals and ores shine under UV light in Sterling Mine Museum, NJ. and there are places where people pan for gold. and rocks are smelted into copper. obscure rocks, in the shadows of death. on ropes swinging back and forth. below is turned upside-down as if by fire. and in its dust are flakes of gold. eyes of falcons have never seen it. nor adult lions have ever hunted there. upturn the very roots of mountains. in their search for precious things. hidden treasures they bring to light. This Sunday we will celebrate the Mystery of Voice. To encounter this mystery we need to learn to listen and to be sensitive to the voices and sounds of wounded nature. My strongest and strangest encounter with this voice came in Kula Kai Cavern on the Big Island of Hawaii. My wife Martina and I were part of a small tour of cave enthusiasts. 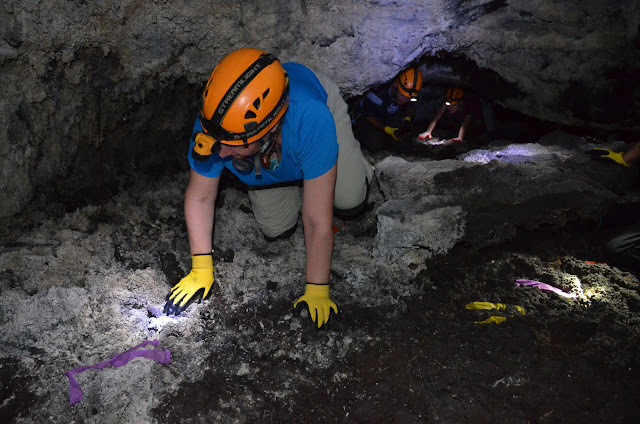 With knee pads, hard-hats we were crawling through passages at times no more than 25 inches high. And then, deep underground we stopped to catch our breaths. There, in the deepest part of the cave our guide offered us an experience often presented in such places. We switched off all our headlamps (they often emit sound), and sitting in complete darkness we listened to the silence. Down in the dark underground I heard the voice of wounded nature. It came to me in the form of a clear high pitched ring (it sounded like a tone D9 ~ 9.4 kHz). It was indeed a cry of nature, but it was not coming from outside. My ears did not hear it: this sound was made by my own neurons somewhere along the central auditory system. After having lived several years in NYC, and after spending ten hours in a jetliner the day before, my auditory neurons decided that that utter silence simply could not be true; deprived of any acoustic stimuli from outside they generated their own sound. Thus I heard the cry of wounded nature, a piece of nature right behind my temple bones. You can imagine how alarmed I was by this discovery. I asked my MD wife and later some of my friends: all assured me, that most likely it would adjust after spending some time in a quieter environment. I can confirm that that was the case: in a few days I could hear silence again without any high-pitched chords. So, please, don’t think that I am bizarre when you meet me in the subway covering my ears or sometimes with earplugs. I occasionally wear earplugs even for bed, especially when our neighborhood is particularly noisy. I am not going cuckoo, I just want to be able to hear cuckoos when I leave the city, I want to protect that part of nature between my ears, and not only for my own sake, but so that I can better hear nature when it sings of joy and especially when it cries for help. Truly the first step to appreciate the mystery of Nature's voice is to protect, appreciate and listen to the quiet: thus we can learn to hear again, and even the quiet-ones can be heard.